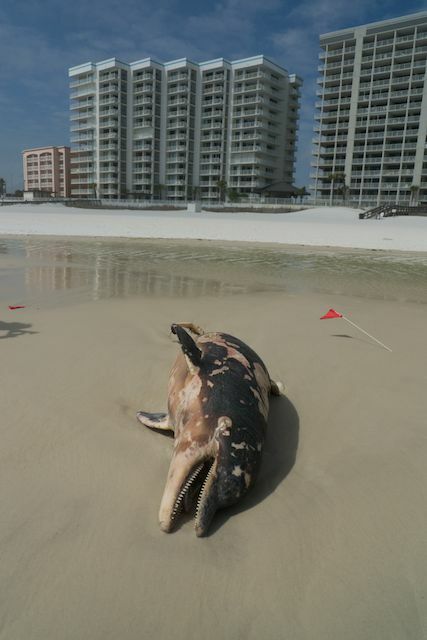 Along the Gulf Coast, the marketing blitz for spring break is rolling out as the oil from the BP blowout 11 months ago continues to roll in along with increasing numbers of dead infant dolphins, in numbers completely without precedent. The beaches remain polluted with toxic oil and dispersant even as local politicians and government officials insist everything is fine and the oil miraculously gone. Thousands of pounds are collected each day from the few areas that remain under scrutiny, all of those being in highly visible resort areas. In one zone on Ft. Morgan beach in Alabama, a record 17,000 lbs was collected in one day after a winter storm rolled through. Along the beaches of Alabama in areas not frequented by media or guests, dead infant dolphins are left uncollected in the sand. Current plans by mayors of resort communities along the Gulf Coast will have thousands of vacationers, including at-risk populations, once again making sandcastles and sunbathing on toxic, polluted beaches. BP continues to shut down the few cleanup efforts still underway with the approval of the federal government. At the Gulf Coast Ecosystem Restoration Task Force meeting in New Orleans recently, scientists, NGO's, and concerned citizens demanded to know how the ecosystem could be restored when the basic cleanup of the oil has been made impossible by any known technology after the dispersant sank it to the ocean floor. Health concerns remained at the forefront of dialogue as a new report by the Louisiana Bucket Brigade finds that nearly 50 percent of the population along the Gulf Coast is experiencing sickness indicative of chemical poisoning related to the BP oil spill. The CDC assertions in a brochure distributed at the meeting that the levels of chemical exposure related to the spill are not a cause for concern was ridiculed and an embarrassment to many of the officials present. Government data collected during the oil spill last summer strengthens claims that oil and dispersant was brought onshore in rain during the spill. The Chief Mission Coordinating Scientist on the NASA remote sensing mission to the BP oil spill in the Gulf Of Mexico was Ira Leifer, Ph.D from University of California Santa Barbara.Dr. Leifer has been working with natural oil spills and natural methane bubble flows for the last decade. He is in the process of publishing analysis of some of the government data collected during the spill. The analysis is based on openly-available airborne and satellite NASA data, recently published NOAA airborne data, and airborne and boat-based data collected over the Gulf and analyzed by Dr. Leifer's team. Other official air quality data, has been unavailable to scientists, the media, or the general public until recently. The data being released, which was collected by the NASA missions to the Gulf, shows that the toxic compounds released from the BP spill became airborne, and significant quantities were brought onshore by precipitation, thereby exposing coastal populations to chemical poisoning. This represents something new and unique not observed in previous oil spills. It helps explain why there were numerous reports by people living along the Gulf Coast that it was raining oil and dispersant during the summer months. After spending some time together in New Orleans I spoke to Ira Leifer at length in Mexico City. IL: I think it is important to establish for the record that the unique aspect of this [BP blowout] is that the volatiles were continuous, it was not a one-day exposure. The chronic nature of the spill and the therefore chronic nature of its health impact is a pretty unique aspect of this event. The reason I think it's important to call it unique is that it gives a way to explain why various government agencies using protocols developed for a single coast spill didn't get it right because it's not the same. I think it's important to give the people we really want to take responsibility a way of saying ah, yes, you're right and jump on the bandwagon with us. We need NIH to fund a 50 to 60 million dollar study because this is something that had never happened before. The data we collected in the atmosphere shows a very high hydrocarbon load and we were able to identify more than 100 compounds in it. Many of them have health implications. There were large amounts of them and they have similarities to gasoline. In that regard the modeling I did seems to suggest that there are reasons for concern. There are reasons to do additional research. JC: How was the data you are referring to collected, and based on that data, what degree of concentration did you find of what you would consider toxic compounds? IL: That is a top question because realistically they are probably all toxic to some extent. But for so many compounds I do not think the studies have been done to say what precisely the threats are -- it's a mixture. The way we did the measurements we had evacuated stainless steel 1 liter cylinders opened up to very gradually and gently allow air to enter into the container and then sealed. These were collected on a boat and also in NOAA airplanes and then analyze by a scientist Don Blake at his laboratory at UC Irvine. The concentrations of any one compound were very low in the parts per billion (PPB) or even less. But many of these concentrations were at sea and this is a good comparison, higher -- much much higher than in Mexico City where I am now and is one of the standards for the worst air pollution in the world. This is what is being experienced or observed and breathed by people on site. The response workers were not wearing a mask [respirator]. JC: What about the population along the coast in the areas where there have been so many reports of people complaining of health problems, specifically Southern Louisiana, Mississippi, the Orange Beach/Gulf Shores area of Alabama? Do you think the data you collected has a direct correlation to those populations and what they were inhaling? IL: People in the Gulf of Mexico were not warned that the air was going to be bad and they had clean air in much of the area right before the spill. It is a very different kind of situation than people who chose to go and try to make money in Mexico City. A lot of people in the Gulf live there because they enjoy the Gulf and they didn't want to move Los Angeles or New York City or the big American polluted environments -- they chose to stay where the environment is pretty clean. In terms of the health implications for coastal communities I think there are two things. I have classified there being three different approaches by which atmospheric phenomenon related to the oil spill can cause health effects. One is the volatiles just breathing the stuff a long way from the incident site. A second one is aerosol, so when oil comes up on the beaches as the wave breaks there is aerosol generated in the air, and that can be breathed by people. The last one which we discovered is the rain. I will add a fourth one which is dispersants. Clearly, spraying dispersants near populated areas is a bad idea. If dispersants are aerosolized that is a bad thing as well. I do not have data on the dispersants so I will speak to what I do know. With regards to the volatiles there are two things the main thing is that volatiles can go a long way on the wind. I did some simple calculations of quantities and exposures in coastal communities. What I saw according to OSHA rules absolutely no problem. If one assumes the volatiles can be health effect modeled as gasoline exposure there is a potential - the dosage rates were high enough for there to be problems. When I did it for healthy adults it seemed worth looking at, but who knows. The big worry is pregnant women and the elderly -- at risk populations. In that regard, at-risk populations, the levels seem to suggest there could be really severe concern for the health-related impacts. What that implies is that it really needs to be studied and looked at. The [published] literature is for people exposed long term to gasoline. The other way is the aerosols. The aerosolization are really tiny droplets smaller than a hair but still pretty large, and they can not stay airborne for very long before they will fall back down to the ground. Maybe a couple of miles inshore. So you would expect people right near the beach would be at risk from aerosol related problems. But once you got 5 to 10 miles onshore it would go back to people just breathing and smelling fumes rather than the aerosol component. Aerosols and their effects are a little uncertain, exactly what it is going to do. We know that aerosolization in past spills always cause a lot of people to get sick. In this spill, probably the same. They are droplets that are large enough that if they get into your lungs your body can potentially remove them, or maybe not because they are tar so it may get stuck in there. I do not know of literature in detail on this in the U.S., there may be overseas. If you breathe in aerosols of oil do you cough them out and get rid of them within a month or do they stay in your body for years? That is a very important distinction. What you would expect to see is that people within close proximity to the beach -- with a mile or two -- would have symptoms different from people ten miles from the beach. And when I say beach it is also shoreline. The last one is the rain. That is a completely new phenomenon that has not been reported. People at California Oil Spill who have done testing on burning have never seen anything like that. But you don't have 102% humidity in California. There is no precedent in past oil spills to consider to know that this is a problem and what its effects are. JC: Part of the data set you collected definitely showed that it (VOCs) was present in precipitation? IL: Not in precipitation. I know there were clouds filled with hydrocarbons. This is from the remote sensing data showing that a cloud -- maybe it is 1/2 mile thick -- had about .1 or .2mm of oil equivalent in it spread out through the whole thing. When it rains, whatever is in it is going to come down, that is just how clouds work. I don't have documentation on the rain. On the other hand there are quite a few anecdotal reports of people saying it's raining oil. What was missing was any explanation of how that could be happening, a scientific mechanism. What my data does is that it elucidates the mechanism scientifically so we can explain exactly how this could happen. It goes from speculation that just have been a water spout and it pushed the oil up into the atmosphere and then somehow it came down in Alabama to actually a very clear connection that can both be studied from the remote sensing data we have and also from people's observations. This would be a cause for concern in the future and burning oil from spills as to whether or not it's a good idea. JC: Going forward, based on the path the data is leading you for further investigation what would you like to see happen now? IL: For myself there are two. To improve the atmospheric model. But more to the point the most important link that needs to be made at this point is that chronic gasoline exposure is a good health model of exposure to the BP oil spill fumes. Secondly to try and get a better understanding -- which seems to be impossible -- what is known about the airborne impacts of the oil spills in the last 10 years around the world. We live in a global world and society, it is silly for us not to learn from the experiences of our friends in Europe who have also experienced oil spills in recent years and documented widespread health impacts. As Americans, if we can learn from them we can avoid the mysterious Gulf Coast Health Syndrome appearing five years from now that nobody figures out what it is until 10 years from now with a lot of people getting sick and very ill in the interim.